It's time to ride the least frequent bus in London. 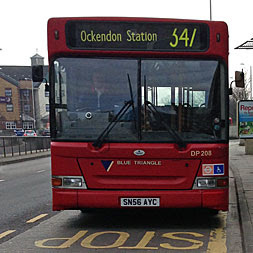 Not counting school journeys or mobility services, no TfL bus runs less often than the 347. It runs only four times a day, Sundays naturally excluded, no earlier than nine in the morning and no later than five in the afternoon. One single vehicle shuttles to and forth during that period, and with buses running two hours apart it's really important to arrive on time. I arrive in good time. Not right at the start of the route in Romford but a mile or so up the road at Gallows Corner, round the back of Tesco's car park. As many as seven passengers have made the journey thus far, two of whom alight to shop and two more board with bags in hand. The bloke behind the sunglasses is probably the 347's regular driver - an infrequent service affords such familiarity - but he doesn't greet any of the passengers like old friends. They sit up front in the accessible seats while I perch alone behind, the sole farepayer aboard the Retirement Express. One particular lady hovers by the door to prevent her basket on wheels from skidding across the floor on the next bend. She stays aboard for only one stop, admittedly fair walking distance, but anything to avoid having to cross the busy arterial A12. We're on the main road to Essex, which begins at the foot of the long broad slope laid out before us. But only the 498 goes there, because we're filtering right to Harold Wood, and speeding past lengthy queues waiting to go the other way. At the station our numbers increase, because we're about to head along roads no other service serves. One of our fresh boarders gets out her phone and starts a conversation the rest of us must share. "I can't hear you," she begins, then proceeds to enquire at great length as to the precise location of the station in Upminster. Most of the ladies sitting around her could have answered, had they been asked, or simply pointed to the electronic display in ten minutes time and said "here, love". At the exit from suburbia we cross Cockabourne Bridge, a short span across the Ingrebourne, then edge out along more of a lane lined by less identikit homes. When one lady flags down the bus and greets a fellow passenger with a hello, I suspect this may be evidence of habitual 347 cameraderie. But no, her friend alights at the very next stop, they were merely near neighbours, except one chose to go shopping in the town behind and the other in the town ahead. I hope she doesn't live in the ugly bungalow with two giant lamps outside and a twee wishing well surrounded by cherubs. There follows a mile with no bus stops, this time because there are virtually no homes. I was hoping that these remote lanes would be fresh ground, but it turns I've been this way before while walking the London Loop. Section 22 exits Pages Wood, a sprawling area of proto-forest planted barely a decade ago, and then follows the 347's route south. Sights include a big junction on the A127, several ponies and pigs, and rolling arable countryside stretching across the valley towards Hornchurch. We've entered the top end of Upminster, along a ridge with long views in opposite directions. One bus stop has the excellent name of "Upminster Tithe Barn Museum", an attraction which opens even less frequently than the bus that runs past. We queue to reach Upminster station, as if to make the point to our loud phonecaller than she needn't have worried. Two taxis are waiting outside the ticket hall to spirit away those who'd rather not wait for the bus. Beyond the railway bridge is one of London's nicer shopping streets, a nucleus of respectability, including the independent two-site Roomes furniture store. A Waitrose, a deli and two Costas? Upminster's more cosmopolitan than you might think. We lose passengers but also gain a couple, a little younger than before. Some have hopped on because we're the first bus to the nearest streets, others because we're the only bus to a little further away. Cranham's Millenium sign is where we make our break for independence - the 346 turns left and the 347 hurtles on. There follow a few streets of big semis and some sturdy-looking pubs, plus a boating shop that must be miles from the nearest navigable waterway. It's here, where real countryside begins, that my last fellow passenger alights and it's just me aboard for the next three and a half miles. One glance at the names of the next few bus stops might suggest why. There follows the remotest stretch of London's least frequent bus route. And yet we are still somehow within the capital, a small bump of which pokes unnecessarily outside the M25 to encompass a landscape of fields that ought to be in Thurrock. The lane south undulates rather alongside scrubby fen and the occasional nursing home. Yes, a few folk do live along Tye Road, but they never moved here to have to rely on a two-hourly 347 so cars are their thing. Even so they still have a far better bus service than most similarly rural locations across the rest of the country, because to be a Londoner is an astonishingly privileged thing, transportation-wise.